Consumers are legally protected against abusive, deceptive, and unfair debt collector practices, regardless of whether or not a debt is actually owed. 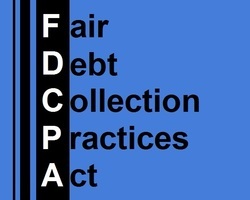 The Fair Debt Collection Practices Act (“FDCPA”), 15 U.S.C. §§ 1692 et seq., governs what a debt collection agency can and cannot do when attempting to collect a debt. A consumer subjected to one or more violations of the FDCPA is entitled to an amount equal to any damage sustained as a result of the debt collector’s conduct and up to $1,000, plus court costs and attorneys’ fees. See 15 U.S.C. § 1692k. State laws may provide additional protections, as well. Contacting any individual other than the debtor's attorney once the debt collector becomes aware that the consumer has retained counsel. See 15 U.S.C. § 1692b. Debt collectors are prohibited from contacting a consumer before 8:00 a.m. or after 9:00 p.m., or at any other time or place known to be inconvenient to the consumer. They cannot call a consumer at work when it is known to be prohibited by the consumer's employer, and they cannot contact the consumer directly after being informed that the consumer is represented by an attorney. Debt collectors are also generally prohibited from attempting further communications with a consumer after receiving written notice that the consumer refuses to pay the debt or otherwise demands that the debt collector cease further communication. See 15 U.S.C. § 1692c. A debt collector cannot use harassing or other abusive conduct in connection with the collection of a debt, which can include using threats or profane language, publicly identifying individuals who owe a debt, advertising a debt for sale in an attempt to coerce payment, making incessant phone calls, or failing to disclose their identity. In addition to the protections afforded to consumers under the FDCPA, the Telephone Consumer Protection Act (“TCPA”) protects consumers from harassing and unwanted phone calls, text messages, and faxes. Among other restrictions, the TCPA generally prohibits a party from calling or text messaging a consumer’s phone via an automatic dialing system or using an artificial or prerecorded voice. In addition to any other relief they may be afforded under the FDCPA, individuals who have been subjected to violations of the TCPA are entitled to up to $1,500 per violation! See 15 U.S.C. § 1692d. According to this section, "[a] debt collector may not use any false, deceptive, or misleading representation or means in connection with the collection of any debt." Typical misrepresentations include failing to disclose that the individual is a debt collector and that the communication is for the purpose of attempting to collect a debt, falsely stating that the collector is an attorney when he or she is not, indicating that the consumer committed a crime, suggesting that the consumer will be arrested or have his or her wages garnished unless otherwise allowed and such actions are actually intended to be taken, or using a business name other than the debt collector's actual business name. See 15 U.S.C. § 1692e. Debt collectors are prohibited from using any unfair or unconscionable means to attempt to collect a debt. Such conduct can include, among other things, collecting any amount not expressly authorized by the agreement creating the debt or otherwise permitted by law, depositing or threatening to deposit a postdated check prior to the date on the check, taking or threatening to take possession of the consumer's property if there is no actual right to possession or intention to take such action, or generally using any text or symbol other than the the debt collector's address on an envelope mailed to the consumer. See 15 U.S.C. § 1692f. See 15 U.S.C. § 1692g. Although the FDCPA generally relates to the conduct of debt collectors rather than the actual creditors, themselves, Section 1692j prohibits a creditor from misrepresenting to a consumer that a party other than the creditor is participating in attempting to collect the supposed debt when this is not the case. This provision is predominantly geared towards dissuading creditors from misrepresenting that they are a third-party debt collection agency or other party in an effort to further coerce payment by consumers. See 15 U.S.C. § 1692j. _Still have questions? Want to know if you have a case? Click here to report the debt collection agency that has been contacting you, and have a consumer protection attorney review your case for FREE!